Mesquite is located sixty miles to the east of Las Vegas on Interstate 15. Due to Mesquite's small size and the proximity of everything to the Interstate, Mesquite is an excellent alternative to staying in Vegas for those who will be traveling long distances in Interstate 15. 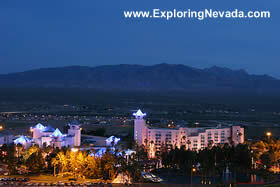 Similar to Laughlin, the lodging, food and other activities are less expensive than found in Las Vegas. And similar to Laughlin, much of the visitation to Mesquite comes from people in nearby Utah and Arizona (Mesquite is also a popular place for people in Utah to come to buy Liquor, too). On this page are listings of the various hotels and casinos in Mesquite, Nevada.